Will The Alabama Legislature Limit Important Workers’ Compensation Benefits? A new year means a new push to harm disabled workers in Alabama. The current effort — a proposal by Decatur State Senator Arthur Orr. This is not a new effort. Senator Orr has renewed his yearly effort to cut-off medical and disability benefits for severely injured Alabama workers. Senator Orr’s proposal will harm our communities by pushing disabled workers off insurance benefits and on to taxpayer-funded government benefits. It’s a bad idea. Legislation that severely and arbitrarily limits medical benefits for ALL injured workers in Alabama. Legislation that severely and arbitrarily limits disability benefits for the workers most in need — the totally disabled. How would medical benefits be limited? Senator Orr proposes arbitrary time limits for medical benefits. After two years without treatment, a worker would face higher burdens of proof at trial. After four years without treatment, a worker would no longer be entitled to medical care. Medical benefits would simply cease. The injured worker would lose his or her right to medical care. That is a harmful proposal for working men and women in Alabama. These arbitrary deadlines would leave many workers without medical care. Consider a worker who loses a leg in a work-related accident and requires a prosthetic limb? When that prosthetic wears out in a few years, the worker would be barred from additional replacement. Consider a worker who injures his or her back in a work-related accident, requiring spinal surgery? A piece of hardware could fail several years later, causing severe pain or paralysis. The area of spinal fusion may suffer later post-surgical changes as well. Yet, these injured workers would be left without care if Senator Orr’s proposal becomes part of our law. What about a worker suffering a disabling injury which cannot be rehabilitated with current medical technology? Under Senator Orr’s proposed legislation, that worker would not be eligible for treatment developed later. The list of potential harms from this new proposal is lengthy. Senator Orr’s proposed legislation places arbitrary time limits on medical decisions best handled by the doctor and his or her patient. The last thing we need — the Alabama Legislature meddling in important medical decisions. Make no mistake — Senator Orr’s proposal does NOT save money for Alabama or its local communities. It increases injury costs. How? Injury costs are increased because some workers will suffer needless disability due their inability to obtain important care while others are shifted to taxpayer-funded resources. Who benefits? The insurance companies which profit from premiums will benefit from the proposal by shifting their obligations to government resources. Medicare and Medicaid will pick-up much of the increased tab. That’s a cost paid by working families. It’s wrong for injured workers to be left without needed medical care. And, It’s wrong for the insurance companies to shift their obligations to working families. How would important disability benefits be limited? Totally disabled workers would arbitrarily lose their benefits at age 65. That’s an arbitrary cut-off when many healthy workers remain employed well beyond age 65 in the modern economy. An understanding of disability benefits is important. Disabled workers do not receive a full salary after suffering their injury. Instead, total disability benefits are only a fraction of wages. Disabled workers currently receive this smaller percentage beyond age 65. Yet, these limited benefits come with a substantial trade-off. Disabled workers never again receive wage raises, bonuses, cost-of-living increases, social security contributions or pension contributions. Their small benefits are frozen in amount. While other workers receive needed raises and pension contributions to save and fund their later retirement, disabled workers do not. Retired workers rely on these contributions and savings to live. Disabled workers receive no additional benefits or savings during the missed years of work. So, at age 65 the disabled worker is left without other typical earned benefits. Currently, a disabled worker receives a small percentage of disability benefits beyond an arbitrary age like 65. Yet, the disabled worker loses much more. Senator Orr’s proposal leaves totally disabled workers financially dependent upon families and local communities during their elderly years. Because of that, many of these disabled workers will require taxpayer-funded care and housing. Senator Orr’s proposal is a very bad and costly idea. It certainly does not benefit injured workers, their families or our communities. Senator Orr’s proposal benefits only one group (for profit insurance companies) at the expense of everyone else. The Alabama Legislature should do the right thing and reject this proposed legislation. If you have questions about Alabama’s workers’ compensation laws, call the Blackwell Law Firm. We understand these laws and their impact on working families in Alabama. 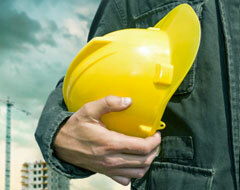 We have many years experience advising and representing injured Alabama workers.